Happy Memorial Day US peeps! Or Happy Monday to everyone else 🙂 Today I am guesting over at Cupcake Craft Challenges (thanks tons for inviting me!) and the challenge is “Royal” make something that is majestic and royally awesome! I thought it was the poifect chance to use Royal (eh, eh?) on a card. 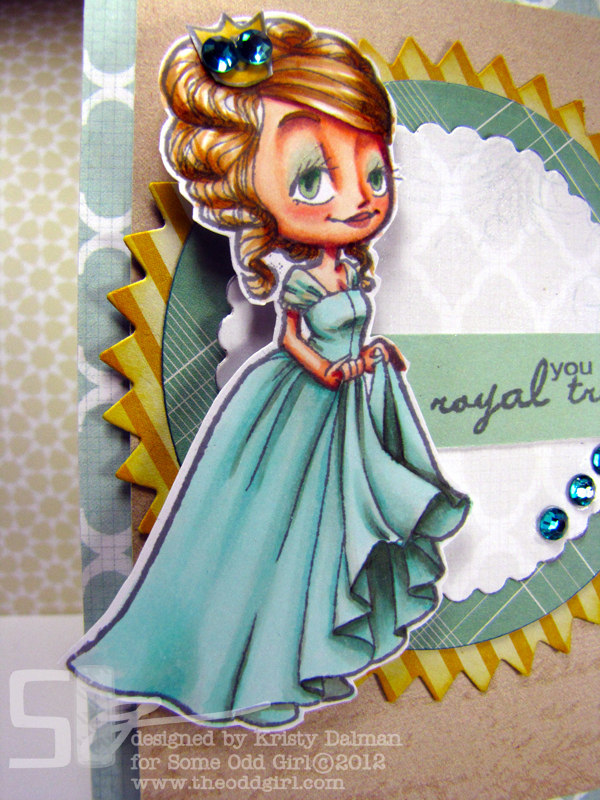 I stamped Royal on Xpress It with Memento’s Grey Flannel ink for a change of pace and colored her with Copics. 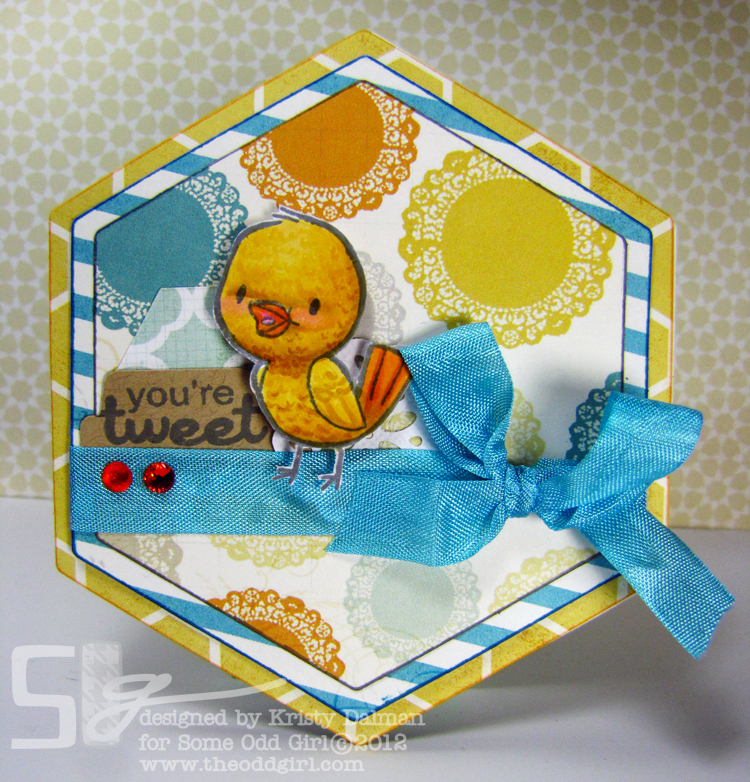 I used papers from yesterday’s hop kit, MME, along with some papers from American Crafts. I *also* managed to make 2 videos to go along with this card! One is my first start to finish card video and the second, that I’ll share tomorrow, is the Speed Coloring video that goes along with it too. 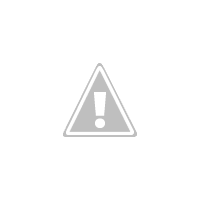 I hope you like the card video. I tried to make it just like I would without the camera rolling so you’ll see I didn’t use everything I gathered at the beginning and some gaps where I’m off camera digging for something. ^u^ I also was trying really hard to stay in shot but it was my first go at a videoing a card so I know I wasn’t perfect. I hope you enjoy it all the same! 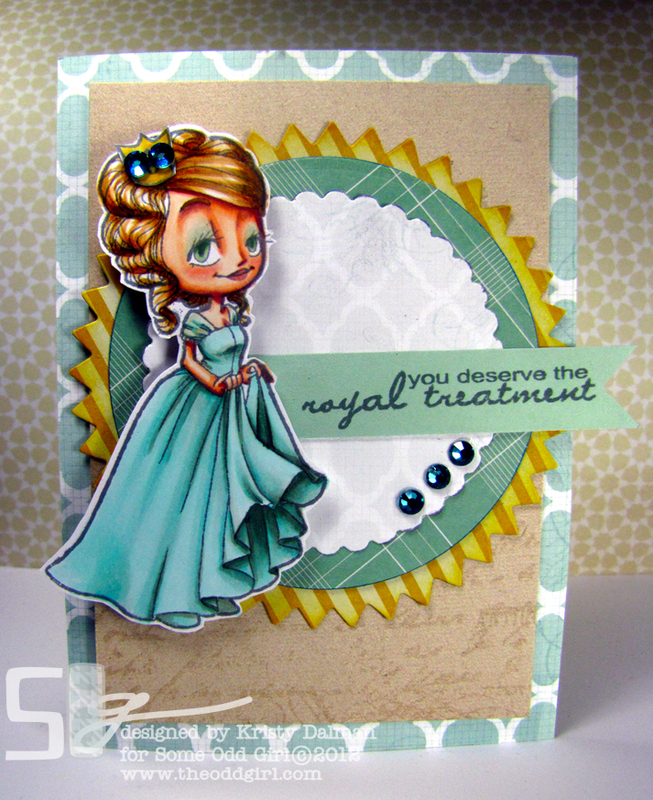 Please let me know what you think of the vid, join me tomorrow for the coloring video and pop over to Cupcake Crafts for the Royal Challenge sponsored by ME, Some Odd Girl Stamps! Gorgeous as always!! Super work! Kristy super beautiful card. TFS and the video, I just couldn’t hear you in the video and wish that I could. I’m fascinated by your coloring. I don’t generally go as dark as you in the shadows and love the contrast you’re able to achieve. What colors are you using for the shadows on the dress and Royal’s face? Thanx.  Beautiful card,your way of putting every thing together first and coloring last makes perfect sense,much easier that way.Love your coloring. Hi Krisky! Your card is absolutely gorgeous and I love how it comes together in your video 🙂 Can I ask which die cut you used to cut the shapes out or was it part of a kit? they were all spellbinders nesties, circle, scalloped and pinked circle (though that might have another name lol) Thanks Davinia!